Alla Ahmed Salim Al Siyabi, an IMCO PST student, was recently honored by HE Sayyed Khalid bin Hillal AL BusaidiMinister ofDiwanRoyalCourtwithin the celebration of honoring Omani photographers who achieved international prizes and awards. Alla Al Siyabi is a young Omani photographers and she is a World Cup winner in Youth Biennalie (Spain 2012) which was organized by the International Federation of photographic Art (FIAP). 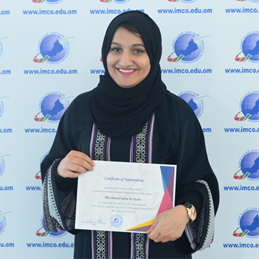 IMCO is very proud of her achievement and wish her more success.